72% of UK businesses suffer from lengthy downtime. Between March 2015 and March 2016 3.9 million UK businesses reported that they had experienced internet downtime. To put that into perspective, that’s 72% of all UK businesses. 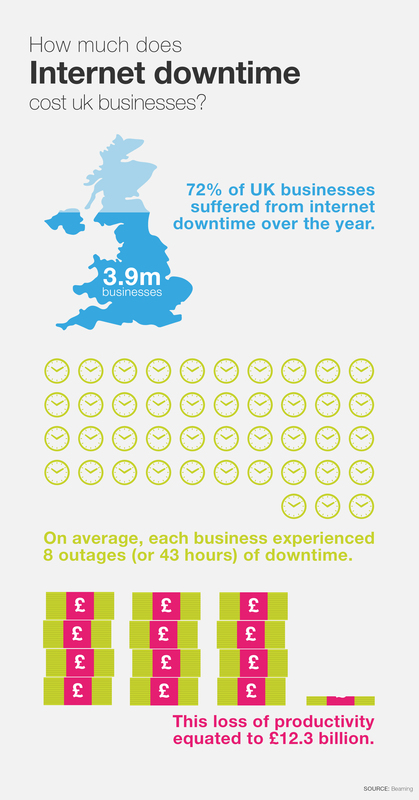 This downtime equated to almost 4 million lost business hours, at an overall cost of £12.3 billion to the UK economy; an average of £3.125 per business. Make sure your business is up to speed with a completely free, no-obligation connectivity review from DuoCall. It’s no surprise that these figures are so high. After all, we now live in a digital world where a large proportion of employees (across a number of industries) rely on internet connectivity in order to do their job. Even those who don’t actively work on a PC or laptop will rely on the internet in one way or another; even if it’s simply to pick up emails or contact people. Each of our office applications are connected and given functionality thanks to the internet. Our files and systems can now be delivered via the cloud; technologies such as hosted phone systems have changed how businesses work completely, and of course our desktops are connected to the internet too. Because of this, any downtime suffered incurs a cost, with up to 13% of businesses reporting that they immediately lost money in the event of an internet outage. These costs can be down to lost productivity as employees are unable to work to their full capacity, or because potential customers are unable to contact you (or visa-versa). Essentially your business operation grinds to a halt when your internet goes down. 38% of businesses reported a complete shutdown to their day-today operations when subjected to internet downtime. Internet downtime can be caused by a number of things, some of which you can’t control. But by ensuring you choose the best provider (who gives you the best connectivity and failsafe solutions) you can make sure your business doesn’t suffer from any lengthy or unnecessary downtime. If you’re looking for reliable connectivity and a support network of experts to keep your business running smoothly, simply get in touch with our team today; we’ll be happy to help!